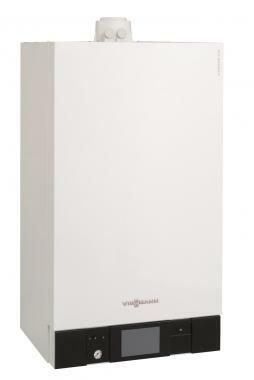 The Vitodens B2HB 200-w is a system gas boiler by Viessmann. It is an extremely reliable boiler with it being a wall mounted condensing model. It is B rated, meaning it has an efficiency rating of 89%, as well as this this unit comes with an output of 19kW. Another way this boiler is perfect in fitting your needs is its compact size with it dimensions being only 450mm wide (1.8 to 35kW). This boiler comes with many other advantages, such as it using up to 98% of the fuel that is used to convert it into heat. This model is super quiet when in operation and this is done through its low fan speed! As well as all these advantages the Vitodens 200-w also comes with an easy to operate vitronic control unit that has a 5 inch colour touchscreen, as well as being available with the option of vitoconnect 100 WLAN adaptor meaning you would be able to control the unit via app or the internet. This is a system boiler with a cascade, with up to six boilers (up to 594 kW) being possible. It comes as either a system or combi boiler. The Vitodens B2HB 200-w comes with 3-5 year warranty too help give you peace of mind that you have bought a reliable boiler.